Fabric Paper Thread: Happy Birthday, Mum! Irene and Ruth, two sisters. Lifelong best friends. I love the way they're standing with their arms around each other. 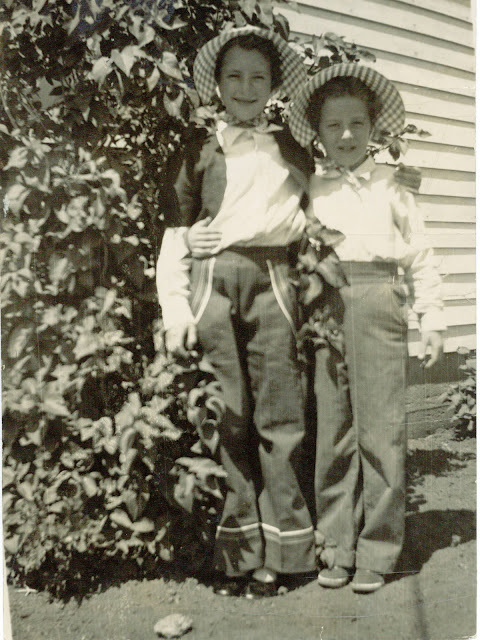 And check out the lining of their sunbonnets - so cute. Today is Ruth's 80th birthday. Ruth is my mother-in-law, a woman whom I admire very much. 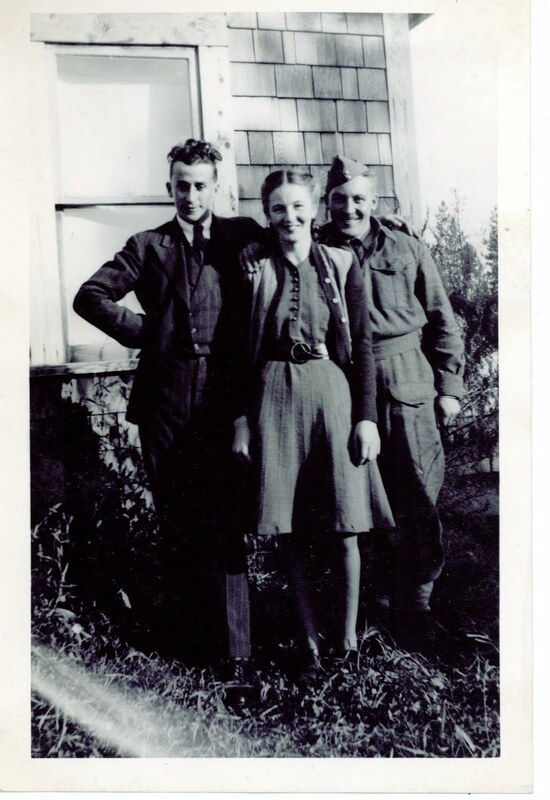 Here's Ruth again, older now, with her brother and a friend I believe. Doesn't she have a lovely smile? 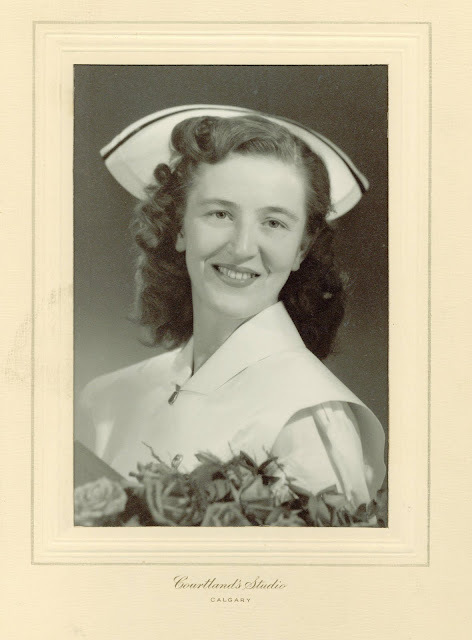 Ruth graduated from nursing school in Calgary in 1953. She met her husband there, and together they had four children. My husband, Tim, is the second oldest. Her life hasn't been easy, but the stories would take hours to tell. She's just finished writing a book about her life, and her family's history. I'm looking forward to reading it. Ruth's faith in God through good and not so good times is an inspiration to me. She prays for her children, her grandchildren and great-grandchildren. She lives a quiet life, but one with great influence in the prayer arena as she prays for God's people around the globe. Ruth is a faithful reader of my blog. So to you, Mum, I'm saying, Happy, Happy Birthday! We love you so much and wish we could hug you in person. What an interesting post about your beautiful mother-in-law. All these vintage photos make it so extra special and I do love the sisters' picture. It makes it all the more fun to know that they've been the very best of friends. I love the example that she has set as a prayer warrior, too. I hope you won't mind if I just go right ahead and wish Ruth a very happy birthday as well — Happy Birthday, Ruth! What a lovely tribute to a very special woman. How special to have a praying mom. That's what I miss most about my MIL...I knew she was 'praying without ceasing' for each of us. Happy Birthday, Ruth. Well, my turn to wish your dear MIL a happy birthday. I would love to read about her family history ! I love such stories and knowing someone actually went through them makes them really special. Lorrie, I have e mailed you about the magazine swap, hope it gets to you. Happy Birthday to your beautiful mother-in-law! It is a gift to have a mother who prays for you and your children - my mum reminds me, each time we speak, that she prays for us. I love those sunbonnets, by the way! Happy Birthday Ruth, you sound like a beautiful and wonderful person. (I think your DIL is a real fan) Many good wishes and much good health for a wonderful year....:-)Hugs.